On the eve of the publication of Holmes Volume 2: The Return of Boro,s Greatest Detective, the fine people at the Baker Street Society have left a wonderful review of Holmes Volume 1 on Amazon. It is always fantastic to get feedback, but this was especially encouraging given that these fellas must see a lot of Sherlock Holmes books. When I started writing the books there was the concern that the more purist of Holmes fans would reject it. As it happens, this hasn't been the case... well at least not yet. Much to my suprise, I haven't actually had a bad review. In the Amazon reviews to date, most people have given it five stars, and the one chap who ducked down to three stars, an "always sceptical", dastardly archenemy going by the name of Moriarty77, said he (I assume it's a he) had added me to "the tiny list of people [he trusts] with Holmes and Watson". You can't ask for much more than that really. 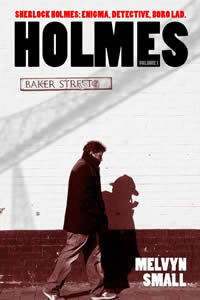 Holmes on Teesside? Ridiculous. But.....this is a fantastic fun, one of the best takes on Sherlock Holmes I have ever encountered. Irreverent, violent and an incredibly entertaining read. More. We want more!! ...so no pressure on Volume 2 then. Holmes Volume 2 will be able to buy on Amazon tomorrow (11/11/16) in both paperback and ebook formats.